The KLE Academy of Higher Education and Research (KAHER) was established by KLE Society (KLE Society or the Karnataka Lingayat Education Society is the founding father of the KLE University. Established in 1916). on 13th April 2006 under section 3A of the UGC Act, 1956 vide Government of India Notification No F.9-19/2000-U.3 (A) under the Chancellorship of Dr. Prabhakar Kore. Ever since its inception the KAHER has not looked back & has achieved accolades from all sections of the society. Within a short time the University today stands boldly with its Triple ‘A’ status viz NAAC ‘A’ Grade with CGPA of 3.16 on 4, Grade A from University Grants Commission and Category ‘A’ from the Ministry of Human Resources Development Government of India. KAHER has also been ranked 4th among the cleanest Higher Educational Institutions in the country by Government of India (MHRD). National Institutional Ranking Framework (NIRF-2018), MHRD, GoI has ranked KAHER with 57th in ‘University Category’, 22nd in ‘Pharmacy’, 25th in ‘Medical’, 84th in ‘Overall Category’ At present, the KAHER has eight constituent units under its ambit and has Medical, Dental, Pharmacy, Ayurveda, Physiotherapy and Nursing Science institutions offering under-graduate, post-graduate, post-doctoral / Ph.D. programs in the disciplines of Health Sciences, including inter-disciplinary research. The teaching hospitals of the University are one of its crowning glories. The Dr. Prabhakar Kore Charitable Hospital & the Dr. Prabhakar Kore Hospital & Research Centre together have a whopping 2400 beds & are thus amongst the hospitals with maximum admission capacity in India . The Charitable Hospital has become a major support system to provide the best Medical & Surgical care absolutely free to the poor & needy patients in this part of Northern Karnataka. Today KAHER stands proud with the strength of meritorious students, dedicated and renowned faculty and an excellent teaching and learning process. The never ending quest for excellence has become the essence of the KAHER. The KLE Society or the Karnataka Lingayat Education Society is the founding father of the KLE University. Established in 1916, the education society transformed Northern Karnataka into a fertile land of educational bounty. The KLE Society was established in the year 1916 and has been serving thousands of people in the field of education for nearly 10 decades. Presently, KLE Society manages a staggering 250 institutions including schools, colleges, technical institutions, research centers, health care & sciences and Business schools. The society runs the institutes in almost all the districts of Karnataka, parts of Maharashtra and even New Delhi. KLE Society ran 38 institutions in the year 1984 and over the years, 262 institutions have been set up during the period from 1984 to 2014 at different localities offering various courses. On 13th Nov 2016, KLE Society, Belagavi celebrates it’s 100 years of service to people in the region and beyond. As part of the commemorations of this momentous occasion, the schools, colleges and other institutions of KLE participated in ‘SHATAM’, a series of cultural and sporting events that incorporate a myriad of human skills and expression. Unmindful of the constraints, KLE ensures that every individual with a desire to learn, irrespective of which strata he/she belongs to in the society has access to infrastructure of international standards. Our well equipped hostels with modern facilities enable every student to enrich himself physically and mentally as well. To ensure that every student is keeping up with the latest developments in technology and the world, all the campuses house internet and IT facilities. Our qualified teachers who are committed and dedicated to their professions strive to make learning a fascinating journey and experience for all. The collaborations with universities in the US, UK and Malaysia have added a whole new dimension to the K.L.E Society making it on par with reputed educational institutions worldwide. The legacy of selfless-service and sacrifice left behind by the founding fathers is pursued sincerely by the Management to this day. Under the unparalleled leadership of Dr. Prabhakar Kore, the KLE Institution has reached enviable heights. His spectacular chairmanship beyond 30 years, with the active support of his team of elected members, embodies the collective efforts of everyone in KLE, including 13,000 members of the trust, 1,10,262 students, and 16,000 strong faculty, in making KLE an international Education-destination. 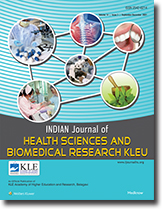 Indian Journal of Health Sciences and Biomedical Research KLEU, a publication of KLE Academy of Higher Education and Research (KAHER) (Print ISSN - 2542-6214, E-ISSN - 2542-6222) is a peer-reviewed online journal with 3 Issues print on demand compilation of issues published. The journal’s full text is available online at http://www.ijournalhs.org. The journal allows free access (Open Access) to its contents and permits authors to self-archive final accepted version of the articles on any OAI-compliant institutional / subject-based repository. The journal does not charge for submission, processing or publication of manuscripts and even for color reproduction of photographs. The Journal encourages academicians and clinicians from various disciplines of health sciences to contribute, review and to promote scientific work and practice evidence base medicine. The journal will cover technical and clinical studies related to health, ethical and social issues in field of Research articles in Medical, Dental, Pharmacy, Physiotherapy, Nursing and Ayurveda. Articles with clinical interest and implications will be given preference.